Is tax evasion making Europe’s crisis worse? On Sunday, we liveblogged the European Commission’s “Debate on the Future of Europe” event in Luxembourg. 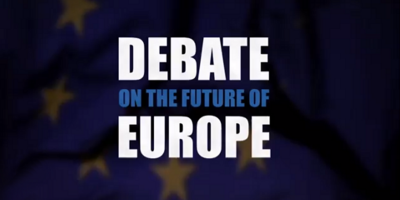 It was a townhall-style debate with Viviane Reding, the Vice-President of the European Commission. Reding, who is from Luxembourg and so was on her home turf that evening, answered questions from an audience on the economic crisis and, more generally, the future of Europe. We will put the video of the event online soon, but in the meantime you can see a few words about the debate from Viviane Reding below (as well as reading our liveblog here). We have to stop with all this ‘solidarity’ nonsense! The countries responsible for these problems should put their own houses in order. Tackling tax evasion seems to be high on the political agenda at the moment, and it was one of the main themes of the recent G8 summit in Lough Erne (you can see European Council President Herman Van Rompuy answering some of your questions on the G8 summit in our recent interview). But just how big a problem is tax avoidance and evasion in Europe? 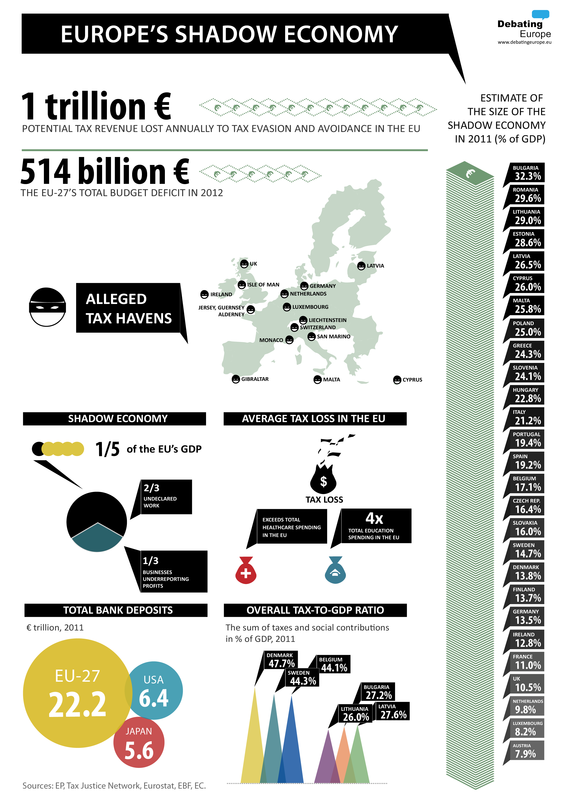 The infographic below sets out some of the facts and figures around Europe’s shadow economy of tax evasion and avoidance (most of the figures are, for obvious reasons, only estimates). What do YOU think? How big a problem is tax evasion and avoidance in Europe? 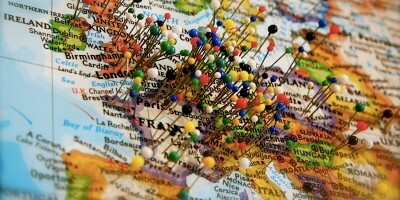 Could tackling tax havens help bring Europe out of economic crisis? Let us know your thoughts and comments in the form below, and we’ll take them to policy-makers and experts for their reactions. tax avoidance is legal and helpful to keep governments in check so it cannot really be considered a problem nor should it stop existing. Tax evasion should be punished and eradicated. Just look at the number of tax haven states and statelets in Europe and how rich they are.. Then you will understand how big the problem is… But our leaders instead of going after the rich tax evaders they prefer to go after the poor.. It is easier… After all we are a liberal contibent shaped after “the land of the free”.. So if you are rich you are free to do what you want… If you are poor, well it is your fault!! everyday tax management is in no way money lost because it flows back into the economic system immediately. It’s the big purses that create the problem by flying off into different economic systems….and in any case we should only have increasing tax revenue if we have an equally growing social support system because otherwise it creates an ever growing (and fattening) public sector which is utterly dangerous ! A lot of money flowing through the tax procedures is very difficult to control all nor car design a perfect anti-avoidance mechanism. For example, in Romania are living in this phenomenon and there is no interest from the authorities to combat tax evasion because it helps fund “political games” on campaign finance etc…Tax evasion is stronger than the EU. In Italy is the biggest one. UK 10.5%….? Aha ha ha ha!!! Aha ha ha ha ha ha ha ha ha!!!!! Aha ha ha ha ha ha ha ha ha!!!!! Well, while there are certainly some actually evading taxes, most people probably just use some accounting-magic to lessen the load. Also, people tend to evade bureaucracy. If one pays someone to do some seasonal job, that has to be done one day in a year, how many would actually go pay the fees for it? Might be, that many just feel, that the taxes in a modern state are unjustly high. Somehow it has to be made more fairly-feeling, and not by propaganda, but by some structural adjustments. It is somewhat probable, that where the shadow economy is around 20%, all of those people involved can not be white-collar criminals. I saw cigarets made in Russia with Russian label sold in EU countries. This tells a lot, no? Tax avoidance occurs through either elastic or poorly worded legislation and/or incompetence in collection systems – both are governance issues. 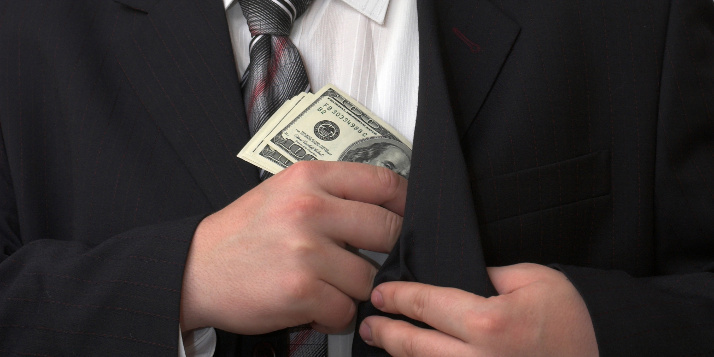 Tax evasion requires a far more robust legislative punishment. Both require a transparent and proactive banking sys..t…e…..m……. Oh – never mind then. Tax evasion takes place wherever idiot politicians and economists raise taxes or impose taxes disproportionate to a) the tax ability of the citizens; b) the social and other services offered by the state. It is not surprising that rotten banks make golden business in such countries. Looking at the map, it is not a surprise that tax evasion takes place in countries with high taxation (direct or indirect) and low quality of state services (former Eastern bloc, Greece, Italy). Taking Greece as example, the stupidity of VAT 23% (instead of 15%) leads to oriental-style bargain between merchants and consumers for a discount desperately needed in order to make ends meet. High taxation in real estate assets (11%) combined to high administrative costs (solicitors, bureaucracy etc. that may account of another 10%) leads to tax avoidance via hiding the real price of the bargain. High income tax (10% from the 1st euro up to 12.000; 18% [12.000-16.000]; 22% [16.000-22.000] etc…) leads everyone who is a salary man to envy the ones who can make money outside the official labour market and try to grab “the chance” to make living well (since, the hardest working people in Europe – 43h/per week; yes! these are the “lazy” Greeks – earn less than 584euros per month with living costs similar to Berlin or Brussels – though I am afraid that in Athens is much higher). There is no doubt that with “stournaria” (small, heavy stones that could not even start a fire – practically useless material) there is no hope of witnessing better days at least in Greece on this matter; however, not surprisingly, “stournaria” are the most welcome partners to the leadership of the West European Usurers Corporation (disguised as “European Union”) and arch-usurer ECB…. Tax evasion also takes place in SELFISH countries that lack CIVIL COURAGE and ALLOW their politicians, plutocrats and indeed all and sundry to SCREW everyone else. Greece and other Club Med nations need to learn that evolution favours FAIRNESS – if they don’t get with the program then extinction [cultural only I hope] is their only fate. Those of the big companies, yes. Those of of the ones who would barelly eat, no! because although it is named as shadow, it is also something that it taken into account as everybody knows that exists.. Funny how the money was deemed laundered when it was deposited in Cyprus, then eurogroup of March decided it was ok to confiscate money from all depositors as a bail-in, and then we learn from bank sources that billions of euros that until then were deemed as “dirty” and “laundered” by all the “goody euro countries”, were welcome in banks in Germany and other European partners (the same ones who gave lovely speeches about how Cyprus was a tax haven) after their banks contacted the big depositors who were haircut to convince them of the security and advantages of their own banking system… ultimately leaving the Cyprus economy bleeding with billions fleeing the country and sending us into a spyral of recession. This is all politics and quite disgusting. Money is only “dirty” when the strong one decides that it’s in the “wrong” pockets! By the way, the Cypriot tax payers just payed an international company to look into our system, after our lovely partners asked for it in exchange for the “assistance”… Cyprus is NOT a tax haven it turns out… Oops, oh well, now just gotta survive with a banking system left in ruins thanks to all this mess… Tax payers will fill in the gap, right? Pelos que eu tenho observado sou contra a sombra da economia europeia porque o dinheiro só é sujo quando o forte que o decide que acabe no bolso errado é preciso vencer eeses josgo de interessee que existe dentro dos politicos dos partidos e do poder empresarial agora quem irá preencher a lacuna é os contribuintes dos estados em deficuldades economicas certo??? The EU = BIG MAFIA, Romania = LITTLE MAFIA!! If the Club Med countries paid their taxes then the Northern European countries wouldn’t have to pay soooooo much soliCHARITY to prop up such fundamentally poorly governed (too much ego/passion/machismo) countries. Can I report tax evaders here? I would like to point out that Barroso, Rompuy, Ashton and their fellow kommissars are not paying a similar income tax rate as ordinary people. Also, people like Christine Lagarde pay nothing at all. These evaders ought to be arrested forthwith! Just because they drew up a piece of paper that says their thieving is legal, doesn’t actually make it so. That which is not just, is not law. No doubt. There should be a real battle against tax evasion. Keep in mind: Tax is Theft and almost all wars in the world are financed by taxes. Not the avoiding of tax is a crime, the hole idea of taking tax from innocent people is a crime. I know this article is nineteen months old, but I want to throw my two cents in. I find it ironic that native Europeans accuse Americans of being greedy and selfish, yet they don’t seem to notice greed is occurring in their own backyard. Tax evasion is a huge problem in continental Europe. It has never been just in the United States. People act like the United States is the only country in the world where greed and corruption run rampant. I’m sick and tired of this hypocrisy of foreigners slamming Americans for being greedy and selfish, yet they turn a blind eye to greed occurring in their own countries. 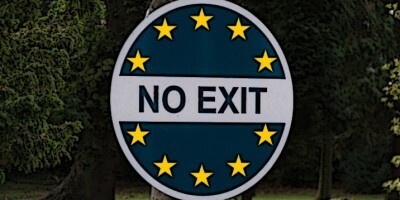 Europeans should enjoy the freebies (free healthcare, paid maternity leave, paid vacation, etc) while they can because it’s more than likely they will lose them or see them cut back drastically as increasing population will make it more difficult for their governments to fund them. No amount of protesting will keep the cuts from coming.